BERLIN (AP) — Developers behind a natural gas pipeline from Russia to Germany said Monday they are confident of getting an outstanding permit from Denmark to close the gap on the 1,200-kilometer (746-mile) route and played down the possibility that companies involved in the project could be hit by U.S. sanctions. 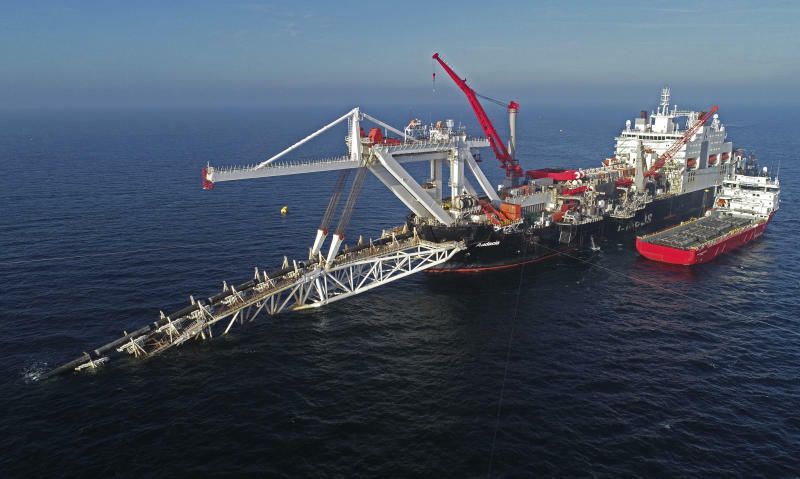 A spokesman for Nord Stream 2 said the company has submitted proposals for two routes around Denmark's island of Bornholm that are currently pending with authorities in the Nordic nation. One of the routes goes through Danish territorial waters and would require permission from the country's foreign ministry. A second route, submitted for approval in Aug. 2018, passes through Denmark's wider exclusive economic zone, skirting both territorial waters and the need for a decision at the political level in Copenhagen, said Nord Stream 2 spokesman Jens D. Mueller. The two options "give us good reasons to expect timely permission from Denmark," he told reporters in Berlin. The Baltic Sea pipeline has come under fire from the United States and some European countries that claim it could increase Europe's dependence on Russia as a supplier of energy. Mueller said developers are confident the terms of a 2017 U.S. sanctions bill and State Department guidelines accompanying it won't have an impact on Nord Stream 2. "We can't comment on any further discussions and speculation," he said when asked about comments by U.S. ambassador in Berlin, Richard Grenell, suggesting companies involved in the project could face American sanctions. "Those are political statements." Last month, the European Union's main institutions agreed on a tentative deal that will tighten regulation and oversight and impose tougher conditions on the Nord Stream 2 pipeline. Under the draft deal, which still needs to be approved by the European Parliament and national legislatures, the EU Commission will have more oversight and power to judge whether a deal threatens competition or the region's energy security. Experts say the regulations will subject Russia's state-controlled gas company Gazprom to EU rules on the pipeline, and it will not allow it to be its sole operator. Mueller suggested that the 180-kilometer stretch of pipes through Danish waters could be laid within a month, once Nord Stream 2 gets the necessary permission. Asked whether the pipeline could avoid Denmark entirely, he said the complexity of the project and its junctions in Sweden and Germany effectively ruled out such alternatives.